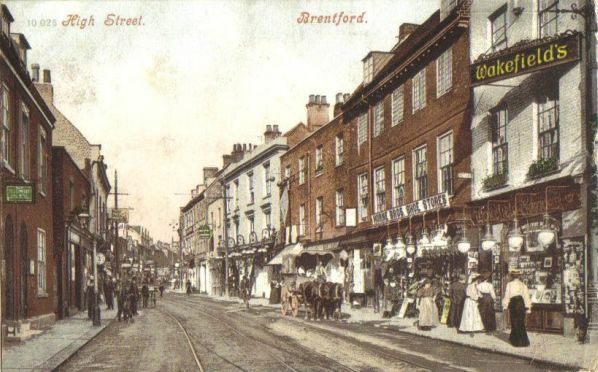 This view shows a bustling High Street, with ladies in large hats window shopping. It was taken looking east from near St Lawrence's church and shows Wakefields, the photographers, on the right at 137 High Street. Although they feature prominently, with stylish gas lamps outside, there is no indication they published this card. Next door to Wakefields is 'Horne Bros Shoe Stores' at no. 136. Further long the name 'Butler' is just visible on a high resolution scan: Albert Butler, leather merchant, was at no. 134 in 1901. The two properties on the left with round-arched doorways are numbers 184 and 185 High Street. The green sign advertises 'Telephone' and the cobbled entry between numbers 185 and 186 is visible. demonstrating how the postcard was a forerunner to today's text messages. Intrigued by this formidable sounding lady (I checked and it was the ladies who wore combinations) I searched the 1911 census and found the Woodruff family living at The Vedw, a 15 room house in Machen, headed by E I Woodruff, a 65 year old widow born in London. Living with her were three daughters (one married) and two sons aged 24 to 34, all born in Machen, all entries showing just their initials. They had a female visitor, J Dicksee, age 29 born London, and a female domestic servant, Gwin Thomas, birthplace not filled in.